After a sensational summer of Sport it is time to reflect on the spectacular successes of the British Olympic and Paralympic teams. Both squads finished second in the medal table (behind the U.S.A and China) but how do they compare to each other? 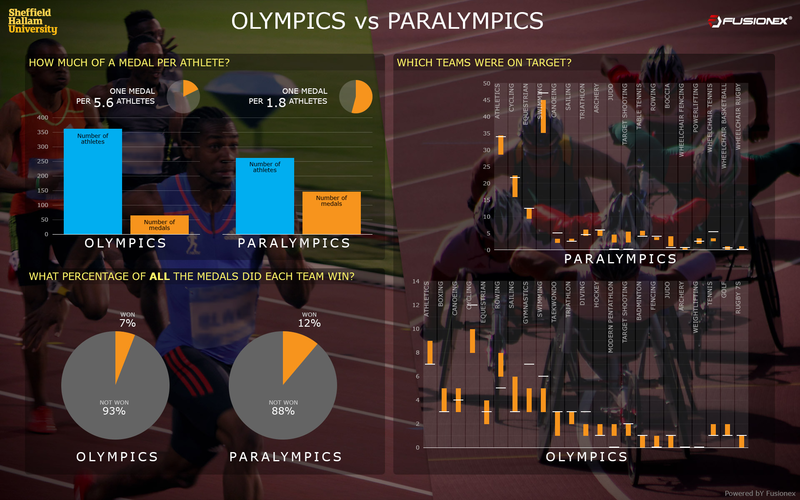 The Centre for Sports Engineering Research at Sheffield Hallam University in collaboration with Fusionex have explored the data behind each performance to reveal the stats behind the medals. The British Olympic squad put in an historical performance, the only nation to improve their medal tally after hosting a Summer-games with 67 medals. The Paralympic squad also improved their London performance, taking home 147 medals in total. On the face of things, our Paralympic team have a monstrous medal haul — 119% more than their Olympian compatriots. This might be because there are many more medals to win at the Paralympics, creating many more medal winning medal opportunities (the men’s 100 metre sprint had 16 separate categories for example). However, the total number of medals available in the Paralympics is 1206 compared to the Olympics’ 974 — an increase of only 24%. Team GB took 366 athletes to the Olympics and 264 to the Paralympics. That’s a medal for every 5.6 athletes that went to the Olympics and a medal for every 1.8 athletes that went to the Paralympics! Using Fusionex analytics we’ve visualised the differences in the image below (click for a larger version). We can also see the teams and the medal targets they were given. Well done to the Olympic cycling, gymnastics, swimming and triathlon who all smashed their medal targets. Well done to the Paralympic swimming and wheelchair tennis who also broke through their upper medal target. The success of both teams shows how proper investment and cultural recognition yields success. We should be proud of the achievements of every athlete who competed in the Rio Summer games. Big data and sensor technologies have made big strides in the last 4 years and in Rio 2016 Team GB benefited from an increased use of data analytics to keep ahead of the competition. Fusionex is a multi-award winning IT software group that helps businesses to improve – by becoming a more data driven organisation – through the use of its powerful and easy to use analytics platform. ← Unconventional aero. How did he go so fast?